T. praecox subsp. arcticus 'Lanuginosus' is a low growing ground cover thyme with no scent or flavor, but makes a very attractive soft carpet of fuzzy grayish foliage topped by bright pink flowers in summer. 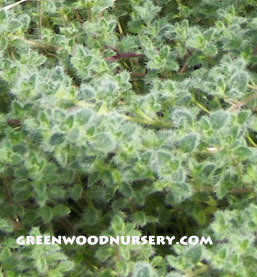 Whether you spell it Wooly Thyme or Woolly Thyme, both versions are correct, this beautiful fuzzy ground cover plant is an excellent choice for any garden or landscape. Wooly Thyme thrives in dry, well-drained locations that receive full sun. It is a hardy ground cover plant for dry soil which will grow approximately 2 to 5 inches in height.